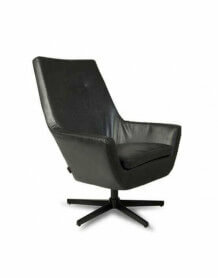 Comfortable lounge chair with a leather vintage look dark gray. Lounge chair Alabama offers comfortable seating in retro, vintage look trendy for your living room. Clever mix of polyester and cotton, polyurethane, called PU leather has the appearance of a smooth and soft leather, but it is less fragile and easier talks. The legs and frame are in black iron.